Oxford University Press, USA, 9780198792987, 208pp. The proposal that the impact of humanity on the planet has left a distinct footprint, even on the scale of geological time, has recently gained much ground. Global climate change, shifting global cycles of the weather, widespread pollution, radioactive fallout, plastic accumulation, species invasions, the mass extinction of species - these are just some of the many indicators that we will leave a lasting record in rock, the scientific basis for recognizing new time intervals in Earth's history. The "Anthropocene," as the proposed new epoch has been named, is regularly in the news. Even with such robust evidence, the proposal to formally recognize our current time as the Anthropocene remains controversial both inside and outside the scholarly world, kindling intense debates. The reason is clear. The Anthropocene represents far more than just another interval of geologic time. Instead, the Anthropocene has emerged as a powerful new narrative, a concept through which age-old questions about the meaning of nature and even the nature of humanity are being revisited and radically revised. This Very Short Introduction explains the science behind the Anthropocene and the many proposals about when to mark its beginning: The nuclear tests of the 1950s? The beginnings of agriculture? The origins of humans as a species? 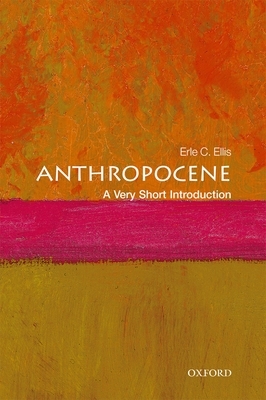 Erle Ellis considers the many ways that the Anthropocene's "evolving paradigm" is reshaping the sciences, stimulating the humanities, and foregrounding the politics of life on a planet transformed by humans. The Anthropocene remains a work in progress. Is this the story of an unprecedented planetary disaster? Or of newfound wisdom and redemption? Ellis offers an insightful discussion of our role in shaping the planet, and how this will influence our future on many fronts. Erle C. Ellis is Professor of Geography and Environmental Systems at the University of Maryland, Baltimore County (UMBC). His research investigates the ecology of human landscapes at local to global scales towards informing sustainable stewardship of the biosphere in the Anthropocene. He teaches environmental science and landscape ecology at UMBC, and has taught ecology at Harvard's Graduate School of Design. Ellis is a member of the Anthropocene Working Group of the Subcommission of Quaternary Stratigraphy of the International Commission on Stratigraphy, the scientific steering committee of the Global Land Programme, formerly of the International Geosphere-Biosphere Programme (IGBP), now of its successor organization, Future Earth, and a senior fellow of the Breakthrough Institute.